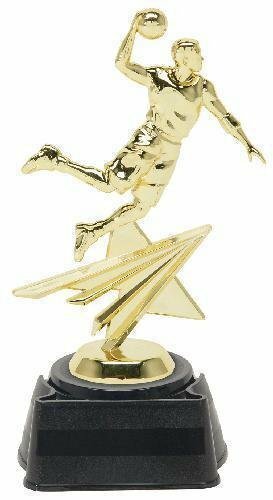 The basketball all star figure that tops this trophy is shown with the basketball in one hand while appearing to fly through the air to give an incredible slam dunk. The full color basketball in the middle of the riser sets a dynamic tone for the overall award. The rounded black marble color finished base has plenty of room for any of your personalization need. This award stands 14" tall. The Champion Basketball Trophy is available with several different inserts. This basketball award has been a favorite for many years. All custom built basketball trophies come with a laser engraved brushed gold plate. You will find a wide selection of basketball awards. The Champion Classic Basketball Trophy is available with several different inserts. This basketball award has been a favorite for many years. All custom built basketball trophies come with a laser engraved brushed gold plate. You will find a wide selection of basketball awards. The Champion Tower Basketball Trophy is available with several different inserts. This basketball award has been a favorite for many years. All custom built basketball trophies come with a laser engraved brushed gold plate. You will find a wide selection of basketball awards. The Classic Basketball Award is an inexpensive basketball trophy that children have enjoyed for many years. These basketball trophies are a great choice for any budget. Basketball awards come with a laser engraved brushed gold plate. The Star Basketball Award is an inexpensive basketball trophy that children have enjoyed for many years. These Basketball trophies are a great choice for any budget. Basketball awards come with a laser engraved brushed gold plate. The Flaming Basketball Award is an inexpensive basketball trophy that children have enjoyed for many years. These basketball trophies are a great choice for any budget. Basketball awards come with a laser engraved brushed gold plate.